The Russian-born conductor Anatole Fistoulari made a notable career in the West following the 1917 Revolution, and was among the first to perform the music of Aram Khachaturian outside Russia. 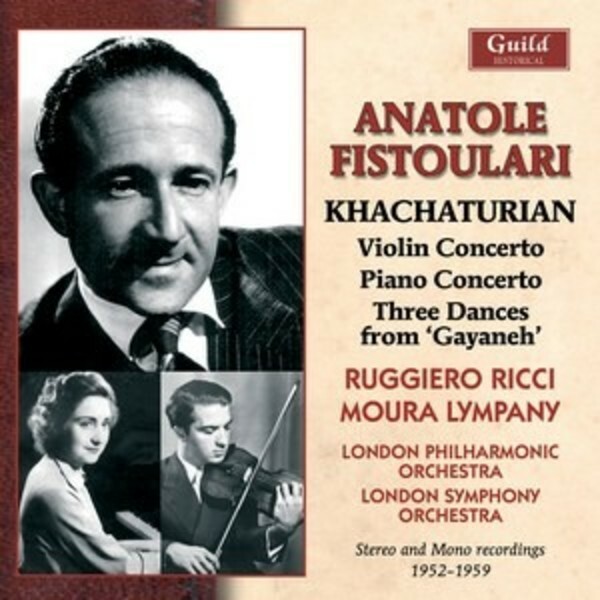 Consequently, his recordings of Khachaturian's music are of considerable interest, and on this disc we bring together for the first time truly legendary recordings of the composer's Violin and Piano Concertos, together with three dances from the immortal 'Gayaneh' ballet. These superb performances, with soloists Ruggiero Ricci and Dame Moura Lympany, are the benchmark accounts of these well-loved works and the transfers have been made with care and skill. The two Concertos are with the London Philharmonic Orchestra, the Dances from Gayaneh are played by the London Symphony Orchestra.